Exclusive! Cats always curl up in a favorite spot-your desk, bookshelf or bedside table, to name a few. Our whimsical Kitty Paperweight makes a great addition to any décor by adding a touch of frisky fun to kitty's go-to locations. Plus, it keeps papers, receipts, grade cards and more, in place and easy to find. Perfect for that special cat lover in your life! 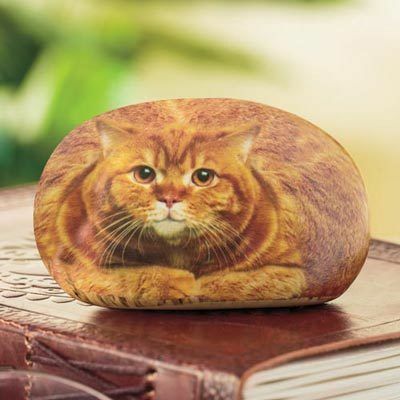 Photo realistic tabby on front; stone-look on back. Resin. 3¾"w.